Reason of stay: Diabetes, Gangrene in foot. How did patient hear about the Phoenix? Recommended by hospital. Mr. Jones’ began his journey at The Phoenix Nursing and Rehabilitation Center on April 1st, 2018, arriving from Interfaith Hospital located in Brooklyn, New York. He sought to be a short-term resident to receive physical therapy on his foot, which was suffering from gangrene. Along with our therapy staff, he would also be assisted with an outsourced company who would be coming into our community to aide him with his walking. Once Mr. Jones arrived at our community, he was very positive with our home. He noticed how clean everything was and noticed the wonderful renovations being done. He admired this because he felt that if the community was under renovations, then they were dedicated to how they presented themselves, which Mr. Jones respected very much. He also noticed how large the community was and that The Phoenix is home to many different cultures, so that was something that made him feel comfortable! Mr. Jones was greeted by everyone here at The Phoenix from the front desk, admissions office, physical therapy, housekeepers, maintenance, social workers, and recreational staff. Towards the beginning of his physical therapy, it was a bit challenging due to his lack of exercise and the severity of the pain he was in, but he trusted the therapists as he believed they were very knowledgeable and very helpful. Mr. Jones was not a very social person, but he did not want to be the type of person to stay in bed all day. He would spend a lot of time with the recreational staff finding out what events were going on, and at The Phoenix, we are big on events! The recreational staff always wants to keep the residents engaged. The goal of Mr. Jones’ plan was to have him complete his physical therapy for his foot while also giving him proper medications to ease the pain. Mr. Jones participated in therapeutic activities such as Urban Zen Integrative Therapy, offering holistic therapeutic approaches to his treatment plan. Mr. Jones began to enjoy his time at our community and was making a lot of progress. He was walking much stronger and healthier. Unfortunately, his insurance began to no longer cover his expenses, and Mr. Jones became discouraged. He did not have a place to live outside of The Phoenix, so he became very stressed. The Phoenix wanted to accommodate him, as we do with all of our patients and residents, so we were able to find another open room for him on a long-term floor. As time progressed, Mr. Jones developed a close relationship with one of our patient concierges. One day, our concierge noticed Mr. Jones was frustrated and stressed while searching for apartments on the computer, so our concierge was able to give Mr. Jones a list of websites and numbers to call to find affordable housing to assist in his search. Mr. Jones truly appreciated the nice gesture from the concierge. Mr. Jones had been very patient with applying for when he finally got a call from housing, they wanted him to move in on the first of the month and they were going to meet his expectations of what he needed, he was also going to have a house attendant come by often to check on him and help him out with anything he needed. Mr. Jones was discharged on January 31st, 2019. He felt a big relief because he was here much longer than expected for a short-term resident, but due to his situation, he had to stay long. Mr. Jones thanked everyone at The Phoenix for being so helpful and attentive while he was at our community. He said he would recommend anyone who needed skilled nursing and rehabilitation, to The Phoenix. We wish him nothing but success and great health! How did patient hear about the facility? Nurse from hospital recommended The Phoenix. Ms. Watson’s journey at The Phoenix began on November 2, 2018, arriving from the Brooklyn Hospital for rehabilitation for her hip and legs. She was very pleased with her transmission into the community. Ms. Watson’s perception of the community was very positive, she loved the new renovations; she mentioned how very clean the facility was and how friendly the staff was. Ms. Watson met a lot of staff, mainly the directors from social services, nursing, recreation, rehabilitation, and also the concierge. After some time at The Phoenix, she began to enjoy herself by participating in the recreational activities, as she was a big fan of playing bingo and also being a part of the concerts. The concierge was very helpful, as he always came to check on her to make sure she was accommodated well. Ms. Watson’s experience with rehabilitation was starting to go very well she was pleased with the staff. Ms. Watson said that the staff were polite and helpful, and she also felt they were very knowledgeable. Ms. Watson was discharged on November 16, 2018 to her place of residence. Her constant dedication to regaining her strength, along with her daily participation in activities at our community, lead to her to have a successful discharge home. It was a pleasure to have her at our community! Discharged To: Home will be in care of family. How did this patient hear about the community? He was recommended by the hospital. Mr. Victor Novoa was admitted into The Phoenix on August 31, 2018, from the Brooklyn Hospital Center for rehabilitation of his leg, he also suffered from a mild stroke. Mr. Novoa’s perception of our community was very positive. He was very pleased with how clean the building was and how friendly the staff were to him. When he arrived to the community, he met the wonderful staff. When he met the concierge, he felt very welcomed because the concierge went with him to his room and greeted him with welcome gifts. He also met the social workers who were very detailed, polite, and knowledgeable about what he needed to have done while staying at The Phoenix. For the first 48 hours of his stay at The Phoenix, he spent a lot of time with his wife who came to visit him every day, he also began his rehabilitation process which was going very well. The care plan was to help him get the strength to begin walking again with the walker. Mr. Novoa had great experiences at The Phoenix. He began to participate in different activities that the recreation staff were hosting such as, board games, tea parties, and concerts. Mr. Novoa was enjoying a successful rehabilitation process while working with different walking exercises. Mr. Novoa would also spend a great deal of time with the patient concierge, discussing personal information about his life, as he wanted someone he could open up to and interact with. Mr. Novoa’s discharge date was September 24th. He was discharged back into his place of residence where he would continue receiving intensive, loving care from his family and friends. He was now able to walk with a walker so that he could continue living his life to the fullest. It was a pleasure having Mr. Novoa here at our community. He was always in great spirits, very positive, interacted well, and was a pleasure for other residents and staff. We as a community wish him nothing but great health and success! Mrs. Ramos was admitted to The Phoenix Rehabilitation & Nursing Center on May 10th, 2018, from an Acute Care Hospital for rehabilitation after surgery on her right leg, which involved stitches. The diagnosis includes presence of right artificial knee joint and anemia, which often causes difficulty in walking. As soon as she was admitted she was greeted by the concierge team and was presented a welcome gift. Followed by the concierge evaluations, each member from the following departments; nursing, dietary, food service, social work, recreation, as well as rehabilitation came to welcome her and gave an initial evaluation. The team assured Mrs Ramos that a personalized plan of care would be created on her behalf to ensure a signature healing program that would provide her with the greatest opportunity for recovery. During the next day, Mrs. Ramos began her physical therapy session. She was able to walk the distance of 50 feet baseline from the time of her first session. In addition to this accomplishment, Mrs. Ramos also enjoyed her time spent during occupational therapy. 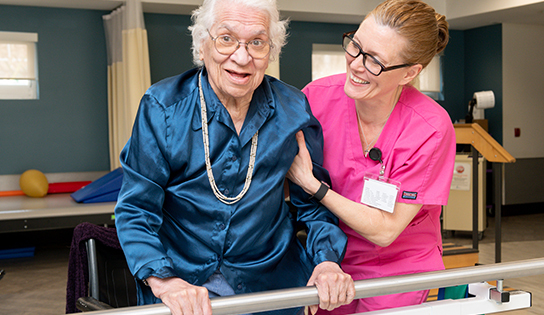 In just a few days of being on therapy, she was able to safely perform bed mobility tasks with modified independence without usage of side rails and even had reduced risk for falls! Mrs. Ramos also was invited to participate in recreational programming during Nursing Home Week. She often attended musical concerts during her stay here. Towards the conclusion of her being in therapy, she was able to walk a distance of 300 feet without great difficulty. Mrs. Ramos was discharged on 5/18/2018, where she had achieved the highest level of rehabilitation. She can now walk unlimited distances as she is back in the community. Great job, Mrs. Ramos on your full recovery! We are so proud of you! Mr. Goodman was admitted to The Phoenix Rehabilitation & Nursing On February 6th 2018 from an Acute Care Hospital for rehabilitation after having complications walking. The diagnosis was acute Osteomyelitis located in his right ankle and foot. Mr. Goodman’s first week at the Phoenix was not the easiest. Adapting to the new lifestyle changes is not the simplest venture. Being introduced to the world of Rehabilitation can be overwhelming, especially when the patient has a normal routine they enjoy. During the first 48 hours, Mr. Goodman was very frustrated. The resident wanted to start walking again and leave as soon as possible. However, things took for a turn when he was met by the new concierge, the social worker, recreation staff and the nursing that was going to take care of him. It was at this time that Mr. Goodman knew that he was in good hands, and to trust the process. Mr. Goodman’s attended physical therapy with the rehabilitation team, and had conversations with the concierge and the recreational staff. He began to understand the methods of rehabilitation, and his time at the facility became a great experience. The recreation staff and Mr. Goodman got along well; between making jokes and sharing funny, personal stories, they connected as friends. Meanwhile the nursing staff provided him with incredible levels of quality care. The rehabilitation team also made sure he progressed from walking with assistance, to using the bicycle machine on his own, and then finally putting him on a “walker-scooter”. By the time Mr. Goodman was ready to leave, he did not need a wheelchair, as he was using a scooter to ambulate. During the last few days, Mr. Goodman was introduced to Urban Zen where he could learn to relax and focus energy going forth. Mr. Goodman also participated in the Karaoke Talent Show hosted by our Recreation Team! On March 21st, 2018, Mr. Goodman was discharged back home. He is now able to walk and get around in his flashy scooter in style. His journey started out as many have, restless and unsure, but after time and dedication, Mr. Goodman achieved his goals and healed! On Tuesday, August 8th, The CareRite Centers Network announced Gary Lou as this year’s recipient of the National Concierge of the Year Award. Gary serves as the Director of Concierge Services here at The Phoenix Rehabilitation and Nursing Center. Gary was recognized by his colleagues and peers for his unprecedented commitment to customer service and patient satisfaction during this year’s National Concierge Conference in New York City. Congratulations, Gary on this outstanding accomplishment and thank you for being #TheCareRiteDifference! Posted in Events, News and Events	| Comments Off on Gary Lou Named National Concierge Of The Year! Reason for Stay: Rehab for lower extremity and shortness of breath. Ms. Lipshie was admitted to The Phoenix Rehabilitation & Nursing Center on June 23rd, 2017 from New York Methodist Hospital for rehabilitation due to muscle weakness in her legs and shortness of breath. At the hospital, Ms. Lipshie met with our Director of Marketing, who introduced all the services / amenities available to her at The Phoenix, while also sharing the community’s outstanding reputation for clinical and rehabilitative care. Ms. Lipshie showed great interest in our beauty parlor services. When she arrived, the concierge department ensure this need would be met by arranging her appointments. She was blown away by the level of customer service at The Phoenix as an appointment was made even before her arrival to the center. The rehabilitation team arranged for physical and occupational therapy five days per week. Ms. Lipshie shared, “I know rehab is not easy because I always feel dizzy, but I am going to try my best.” After several follow ups by the team, she shared wonderful compliments on behalf of the interdisciplinary team. During the first two weeks, she regained her strength from practicing on parallel bars. Currently, she is working her endurance to the point of upgrading to exercising on the stairs to practice her steps. She also attended occupational therapy to improve ADL self-care, bed mobility, and functional mobility. On July 17th, 2017, Ms. Lipshie was discharged home with a walker! She’s able to now walk short distances and almost two flights of stairs! Congratulations on your progress!